In the summer of 1999, Michael Foundation, Inc. published Part IV of The Urantia Book as a separate publication. Urantia Foundation subsequently sued Michael Foundation. A series of events followed which resulted in the loss of Urantia Foundation's U.S. Copyright. Various documents related to this matter are provided below. 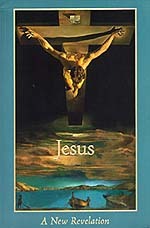 "Jesus: A New Revelation" is now once again available from Michael Foundation. You may contact Michael Foundation via email for more information. November 20, 2001 -- Federal Court denies Urantia Foundation's petition to stay judgment pending appeal. September 13, 2001 -- Urantia Foundation files legal documents for appeal in the Michael Foundation matter. The Foundation subsequently filed an additional motion with the Court seeking to have the effect of the Court's decision stayed until the appeal process was completed. June 20, 2001 -- Oklahoma City Federal Court places the U.S. copyright to The Urantia Book in the public domain. August 2, 2000 -- Michael Foundation files Counterclaim for Declaratory Judgement invalidating Urantia Foundation's claim of trademark in the words "Urantia" and "Urantian." May 12, 2000 -- Michael Foundation files a Motion for Declaratory Judgment against Urantia Foundation in federal court in Oklahoma, which is in the 10th federal judicial circuit. This motion requests the court to determine whether Urantia Foundation has a valid copyright to the Urantia Book in general, and Part IV of the Urantia Book in particular. See text of Michael Foundation's complaint. Comments from Carol Herren regarding "Setting the Record Straight"
Paul Snider comments on "A Call to Spiritual Unity"
November 19, Al Wolf; "A Call to Spiritual Unity"
November 15, Essay by Saskia Raevouri; "A Call for Common Sense"
David Kantor's response to Dave Elder's Essay, "Separate Publishing"
An Essay by Dave Elders: "Separate Publishing of Part IV of The Urantia Book: Some Philosophic Considerations and Implications"